Gallery 9 presents Rebecca Pearson. Her background in stage design at the National Institute of Dramatic Arts (NIDA) is germane to her snow domes, candle-holder museum curiosities and layered Alpine lands. Pearson is a collector of nostalgia - other peoples stories and memories of a collective humanity. She rummages through op shops, gathering, discarded belongings, especially old souvenirs and travel books. 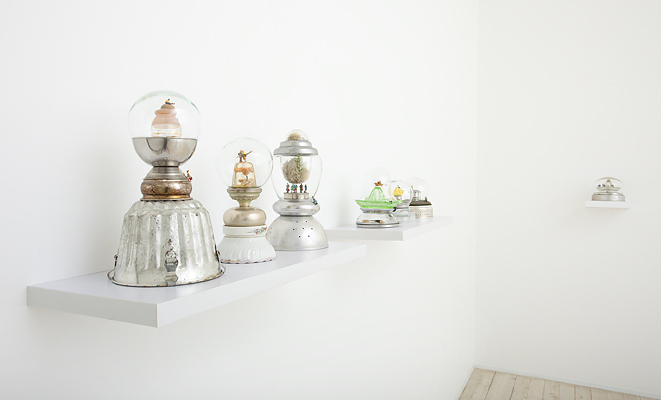 Pearson creates worlds, in layered collages and wall-hung snow domes, which feature snow- capped mountains. This is not a coincidence but a mobilisation of sentimentality. Chocolate box scenes of wintry landscapes, postcards from utopian northern European lands: these scenes are unusual for most Australian dwellers and therefore curious. Pearson taps into this human longing for places we have never seen, except in movies and other people's photograph albums. "Our memories are changed by history and reinterpretation. Souvenirs are reminders of an original experience which has become changed by time. But Pearson also transforms her Alpine scenes by incorporating a palm tree, for instance, in an otherwise icy scene. This is a link with issues of global warming, literally 'the disruption of the planet."